This restaurant is located in Larkspur just a couple blocks from the original Lark Creek Inn. They have their main high end Picco restaurant next door. Pizzeria Picco has Straus Dairy soft serve for dessert. Their pizza’s are named after bike companies. Someone is really into biking here.. Flash Frozen pizzas also are available. Decor, Vibe - Modern decor with lots of wood showing. Counter seating inside and some tables outside. Families and friends in their 40’s were dining at the time. Margherita ($10.95) tomato, basil, mozzarella, parmesan and De Padova extra virgin olive oil had a super crunchy Neapolitan style thin crust and even a crisp center. Quality cheese and olive oil. Better than the other pizza we had. Specialized ($13.50) Hobbs’ pepperoni and house made sausage, tomato, mozzarella and basil looks great but did not have the crunchy crust of the Margherita even though it looked the same. Crush was more chewy and mushy. The sausage was a little zesty. Pepperoni and house made sausage were in plentiful quantity and tasted good. Not much cheese on this pizza. Note: We took the got the pizza to go and ate it 2 minutes after we got it. The pizza came in about 15 minutes, pretty quick. Service was good. If we were in the area and wanted pizza, especially margherita pizza, we’d come back. We wouldn’t drive all the way out here just for the pizza. Compared to our favorites, we’d rank this place below San Francisco’s top places including Gialina, A16, and Paulines. Reasonable wine prices with glasses from $6. 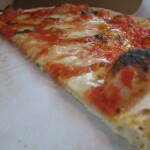 I will give Pizzeria Picco 5 out of 8 slices.